The day of Elements has arrived, starting shortly in Wellcome Collection. And that means it’s time for our final Elements film and blog post, on copper. A beautiful metal that comes in various gorgeous shades of blue, green or, well, copper, depending on its state, copper is also incredibly useful. Its electrical conductivity in particular has been central to our systems for transmitting information, done through copper wires. This property, said Andrea, really transformed the world in the 19th Century following the work of Charles Wheatstone in the area of telegraphy. It also makes really great cookware, because of its thermal conductivity. Andrea has a lovely copper pan which you can see early on in the film, but using copper directly with food can result in the food having a slightly metallic tan. We had a go at filming the tinning process necessary to coat the copper and stop this transferring to the food, but, ah, it didn’t go very well so that didn’t make the cut! Hope you enjoy the event tonight. You can see the full playlist of Elements films, including last year’s, on this YouTube playlist. For more information about the event, which is happening today, (Friday 22 June) from 19.00 to 23.00 at Wellcome Collection, see here. Gold is the third in our series of films created to tie in with Friday’s Elements event (the previous two were tin and silver). This beautiful metal has played a huge and important part in human history, but how much do you know about its actual properties? One of the appealing features of this metal is its constancy; it doesn’t tarnish or change over time. But it isn’t as unreactive as it seems. One of the experiments that Andrea demonstrates in the film above is what happens when you drop mercury onto gold leaf. The gold dissolves into the mercury, leaving an amalgam. This process has been used to separate out gold in the mining process, after which the mercury and gold amalgam is heated and the mercury evaporates away again. However, mercury is toxic, and Andrea pointed out that in some places careless use of this process allows mercury to escape into the environment and into water systems. Another way of dissolving gold is to use ‘aqua regia’, which is also demonstrated in the film. Andrea told me that Niels Bohr used this trick to dissolve his gold Nobel Prize to keep it out of the hands of the Nazis. The gold Nobel Prize solution was left untouched by them during the war, and he was able to retrieve it afterwards, precipitate out the gold and send it back for recasting. You can see the full playlist of Elements films, including last year’s, on this YouTube playlist. For more information about the event, which is happening this Friday (22 June) from 19.00 to 23.00 at Wellcome Collection, see here. The second in our series of Elements films is silver (the first was tin, which you can read more about in yesterday’s blog post). In the video above, Andrea Sella talks about what is behind silver’s tendency to tarnish and how you can restore it to its natural brilliance with a simple trick. It’s not in the video, but Andrea also told me about his prized Dewar flask (see the picture). Andrea has an interest in glassware and its history, and this is his favourite piece. Towards the end of the 19th century, physicists were working on liquifying air and needed some means of storing this very cold liquid for long periods. This container would require really good insulation. James Dewar, who was working at the Royal Institution, came up with the solution that would become known as a Dewar flask. The flask has an inner and outer ‘shell’ of glass, which have a vacuum between them that ensures that energy can’t be easily transmitted from the inside to the outside of the flask. But Dewar also used a technique that created a very thin layer of silver on the inside of the glass. It’s this that gives it the beautiful reflectiveness which helps to keep heat out. It is, as Andrea says, perfect double glazing. This Friday sees the return of Elements at Wellcome Collection – this time on gold, silver and bronze (tin and copper). 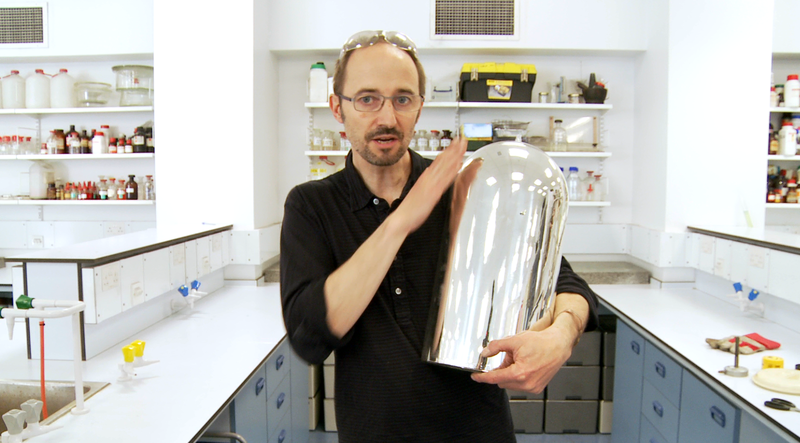 I also returned to Andrea Sella‘s lab at University College London to film short pieces about each element and find out what makes each of them special. The video above is our examination of tin. It cries, and it makes other beautiful sounds in the form of bells and church organ pipes, but it is also susceptible to a strange ‘disease’: tin pest. Andrea has been hard at work these past few months trying to recreate tin pest and shows us how he did it. Although it didn’t make the cut, Andrea also pointed out that tin is used in our mobiles phones in its oxide form as part of the display. Cassiterite is the main source of tin, and in ancient times there was enough of this being mined in Cornwall for Britain to become known as the “tin islands”, the Cassiterides. But today, most of our tin comes from Central Africa, especially the Democratic Republic of the Congo. The huge amounts of money involved, said Andrea, are fueling civil war in the DRC. Perhaps, therefore, we should be rethinking this relationship with tin. When I first heard the London Bulgarian Choir I knew it would be really interesting to find out how they create that incredible sound. In a quite different way to the more operatic “bel canto” style of singing, they are able to create a very powerful, bright sound which includes some unusual effects and ornamentation. Dessi Stefanova, founder and leader of the London Bulgarian choir, graciously agreed to be interviewed on the subject. Experienced in teaching non-Bulgarians how to change their voice to produce this sort of singing style, she was able to explain exactly what she’s doing with her throat in singing – creating a “twanging” sound she likens to a seagull or bagpipe. Making this film was enlightening. Though I’ve always enjoyed singing, I had no idea it was possible to think about it in this level of anatomical detail and to control it in this way. Discussion of the harmonics was particularly fascinating. I guess I knew in some sense that one note is in fact made up of several notes, harmonics, at once, but hearing Dessi sing makes it clear. Her voice style amplifies certain of those harmonics to create an effect like two voices singing from one. It’s not quite as marked as that of Mongolian or Tuvan throat singing (“overtone” singing), but it’s there. Whilst I was preparing for the film, Dessi directed Alex and I to a BBC radio show on the human voice which she’d been a part of. I recommend a listen (it’s called Discovery – Musical Instruments 1 from December 2010). It even tells you how to get the overtone effect in your voice. In a bit I sadly had to cut from my film, Dessi also talked about other folk styles which use this, including a Sardinian style: singing “a tenore”. The Unesco film above turned out to be just one of a series which led me off into a wonderful journey of discovery, in particular introducing me to various traditions of polyphonic singing (e.g. Georgian or the Aka pygmies of central Africa). Absolutely fascinating. Dessi and the London Bulgarian Choir will be appearing at our Get Mouthy! event on Friday 30 September. So often the unsung heroes of organisations such as ours, the cleaning team at the Wellcome Trust and Collection are in fact a vital part of our whole enterprise. The buildings are vast and have high numbers of visitors; they also have specialist requirements (and even a ghost, apparently! ), so keeping us dirt free is quite an undertaking. It seemed obvious to go behind the scenes and find out more about this as part of our current Dirt themed activities. So I took my camera, followed Ashley and Alejandro around the galleries while they cleaned up the weekend’s mess, and interviewed them alongside Vicki Escobar, who manages the contract for Strand. I was absolutely amazed at the sheer scale of the operation. It requires everything from window cleaners to abseilers, and the film took me to parts of the building I had never seen before. The final Elements video from my shoot with Dr Andrea Sella takes a look at iodine, an element with many different guises. I could have spent all day filming the smoking purple iodine, it was quite beautiful. Elements presents a world of immersive chemical performance, ingestion, activity and intrigue across all four floors of Wellcome Collection on Friday 8 April, 19.00–23.00.